What does the perfect Brooklyn apartment look like? Well, probably quite a lot like the stunning photos below – the handiwork of architects General Assembly. This quirky pad is the epitome of low-key luxury. 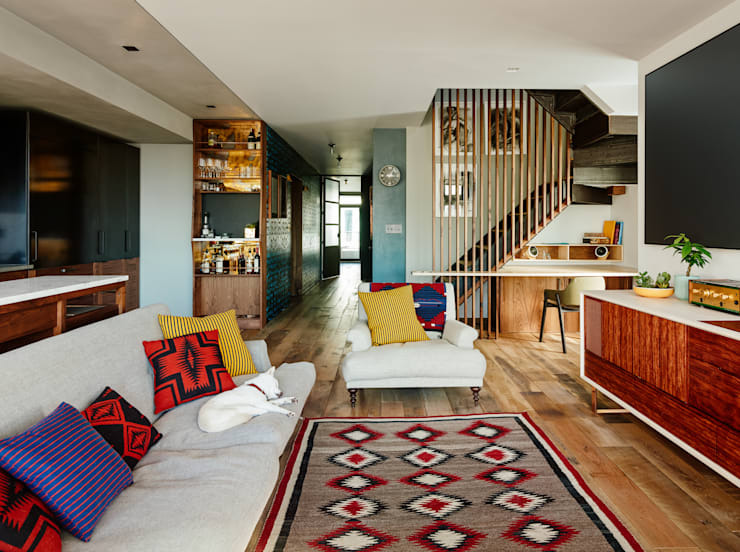 The interior has been designed and the furniture curated with quality in mind; but although there’s not a bargain-basement item in sight in the whole of the apartment, the end result is anything but showy. 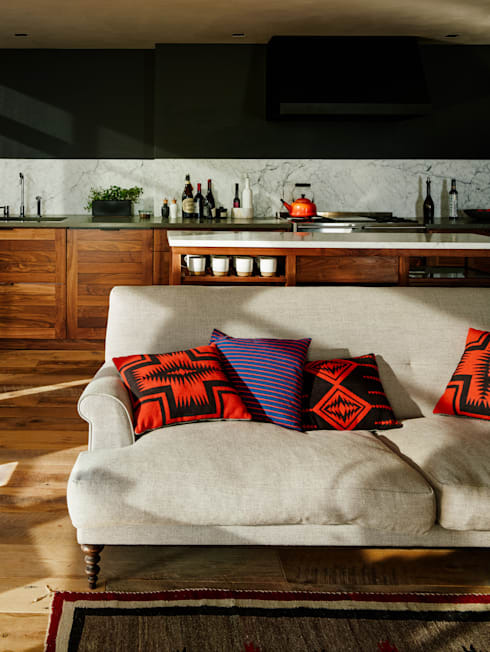 Instead, the eclectic range of pieces on display makes the contents of the home seem casually thrown together by someone who just happens to have a great eye for what works well with what – as opposed to having been painstakingly designed by a professional. 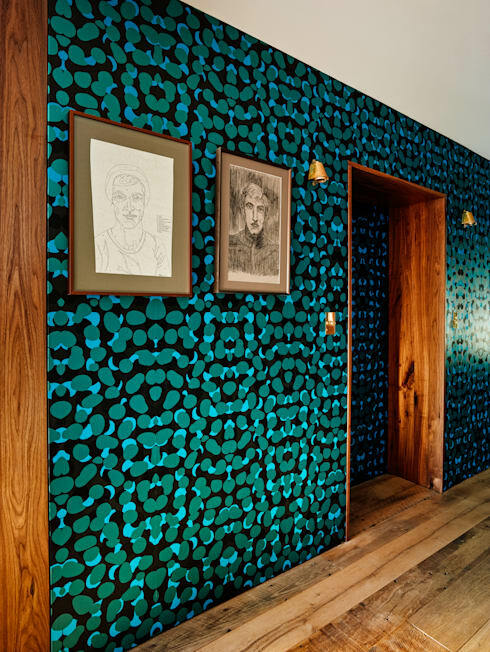 The beautiful wood used throughout this space is at the heart of what makes it so very special. This part of the apartment’s charm is in its bones; that lovely floor would, on its own, make this a gorgeous room even without the addition of the furniture. But the furniture has been perfectly chosen to work with the ashy tones of the planks. Take the sideboard seen on the right-hand side of this image, for example. Although the wood is not a match for that seen elsewhere in the room, it’s the ideal tone to warm up the space without clashing with any other the other elements. One of this apartment’s great strengths is its impeccable use of accessories. Here, the neutrality of the sofa is tempered by brightly coloured pillows, which add just the right amount of colour and fun. This is possibly the photo that best summarises the laid-back elegance of this apartment. The chairs chosen for this area are anything but fancy, but they demonstrate a great eye and a fine awareness of detail. The table, too, is a striking example of design that needs close attention in order to be fully appreciated. Those gaps in the wood, and the inlaid wooden “stitches” that bridge them, make this into a real conversation piece. 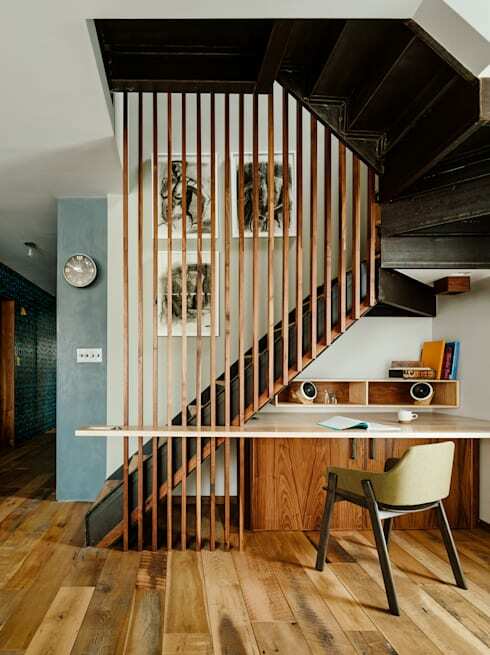 Over at the staircase, the designers have capitalised on another opportunity to make use of some really nice wood. The incredible view, like the floorboards, is a key element of this look. Move things around all you want, but there’s no covering up that breathtaking vista. 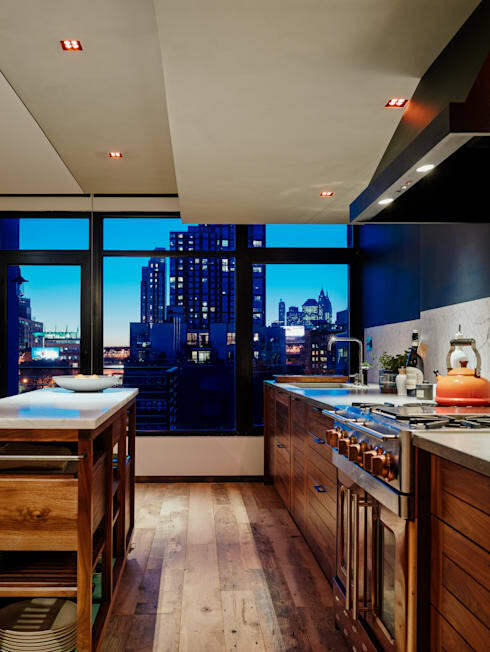 By night, thanks to the view and the enormous windows, the apartment takes on a whole new character, as seen here in the kitchen. But it’s not just the backdrop that makes this a gorgeous room; both the quantity and, more than that, the quality of wood seen here again make for an irresistibly appealing space – an appeal enhanced even further by the consistent consideration of details (look at the knobs on the cooker!). Out in the hallway, big risks with wallpaper and art pay off big time. 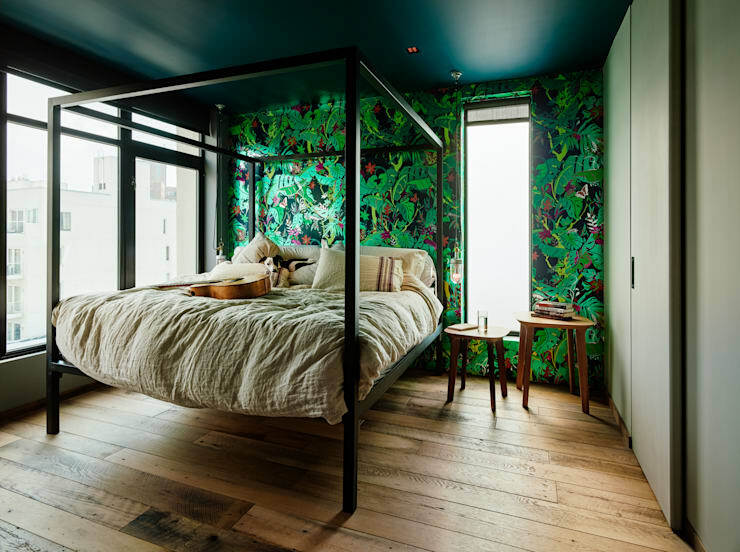 Inbuilt storage and minimal furniture leave the stage free for that fabulously loud and lively wallpaper. 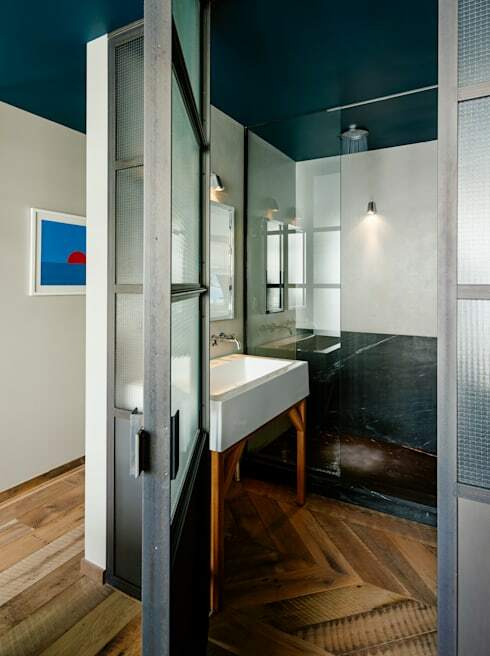 The wooden legs of the sink, combined with its blocky oblong shape, seem to hark back to a more basic time; but that rain shower is all modern day indulgence. What do you think of this project? Tell us here!